Hi all, in this demo i will describe about HashMap in java. An object that maps key to values. A map cannot contain duplicate keys;each key can map to at most one value. This interface takes the place of the Disctionary class, which was a totally Abstract Class rather than an interface. HashMap is important for selenium as well as for interview also. hashMap is a Map based collection class that is used for storing Key & Value(associated with keys). 1).It is donated as HashMap. 2).Hashmap contains only unique elements. 4). Hashmap maintains no order. 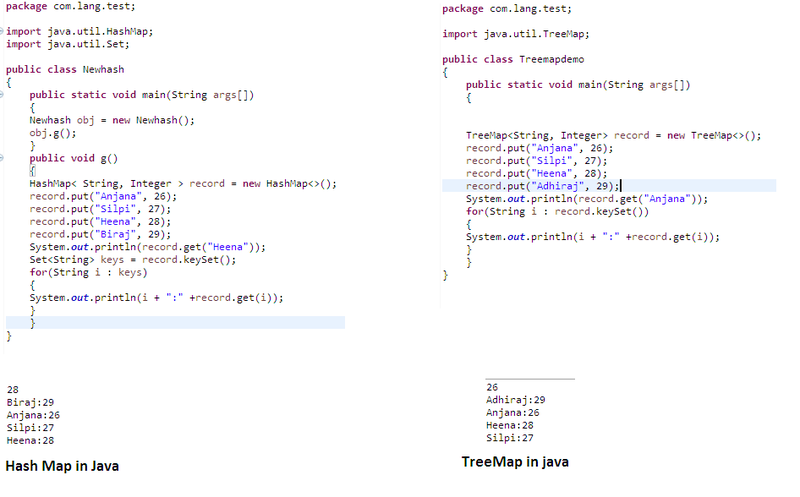 Here is the example of HashMap in Java. TreeMap class implements Map interface similar to HashMap class. The main difference between them is that HashMap is an unordered collection while TreeMap is sorted in the ascending order of its keys. Here is the example of TreeMap in Java. Hi all, in this demo i will describe about for-each loop in java. This loop is important for selenium as well as for interview also. So as the name says when we want to perform some operation with each element of the list or collection or array, then we use this loop.